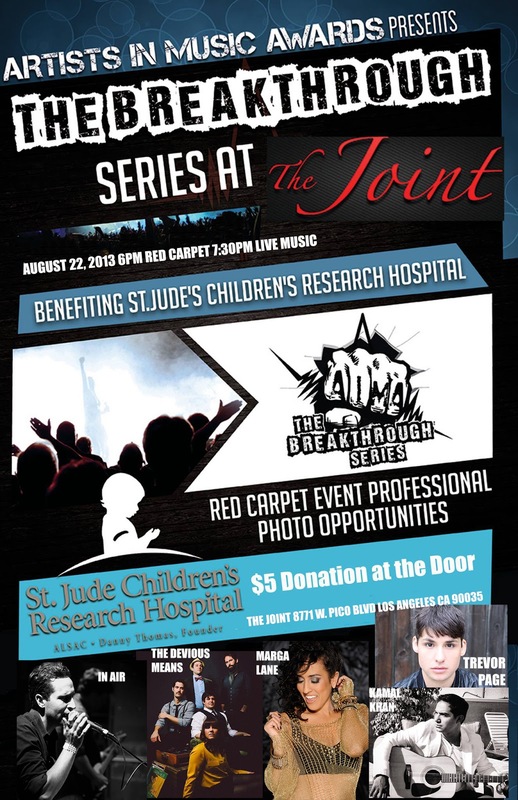 We are very pleased to announce our next St Jude Children Research Hospital Charity & Red Carpet Event featuring live performances by The Devious Means and 2012/2013 Best Alternative Artist - In Air, plus performances by Trevor Page, Marga Lane, and Kamal Khan at The Joint on August 22. $5 - Cover charge (recommended donation) at the door. We will also accept higher donations at the door, which will benefit St. Jude Children's Research Hospital, but it is not required. 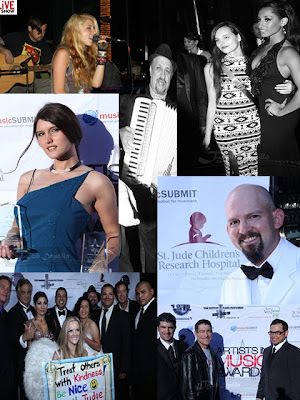 If you're a 2012/2013 AIMA trophy winner and you didn't bring your trophy with you to our 8/8 event at Bugatta, bring it with you on August 22 and get photos with your trophy on the Red Carpet. This is your chance to gain some publicity. If you're a 2014 AIMA Nominee, please come and get photographed with our Official 2014 Artists In Music Awards Nomination plaque. Also, if you're an LA Music Awards recipient, you are very welcome to bring your award plaque with you to the red carpet event. I have visited your blog on '' MUSIC STYLE '' that is important entertainment movement . I gained more tips greatly . From this blog I learned many strategy on music awards . Really , I supported your blog . Internet marketing guru strategy. You can post it in online publications and publications if the information is good enough. This is a fantastic way to identify your business' popularity in the community. ">If you want to be successful, you can try your hand at Internet marketing guru. Below are a few brilliant and proven methods to handle your Internet marketing guru effort towards success. Make a advertising site for your company as an Internet marketing guru strategy. You can post it in online publications and publications if the information is good enough. This is a fantastic way to identify your business' popularity in the community.